In September 2014, back then, the US President Barack Obama achieved that members of the North Atlantic alliance agreed to increase the defense spending to 2% of GDP within 10 years. The current head of the White House, Donald Trump, insists that the members of the Alliance pay immediately, without waiting for 2025. 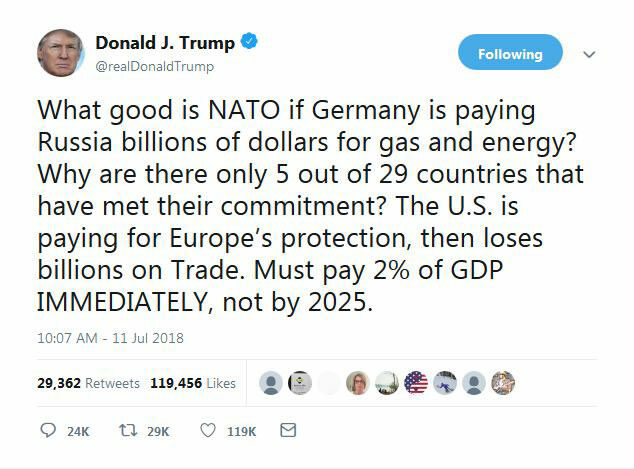 Moreover, during the July NATO summit in Brussels, Trump put forward to double the military spending. According to the representative of the White House, that was not an official US demand, but only a suggestion made in the context of the need to increase defense spending. Despite this, Trump's statement created an uproar in the expert and political communities of most countries in the world. 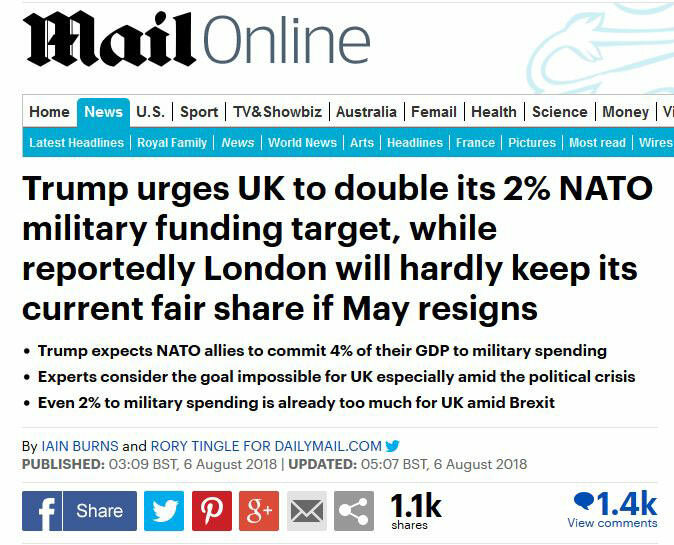 He's been criticized not only by those who put off the increase in spending on NATO as much as possible, but also by those who are going to pay their bills, including the UK, which is spending 2.1% of its GDP for the defense of NATO allies this year. In the conditions of political fragmentation of both the society and the UK parties, bound with the absence of a specific treaty on the withdrawal of the country from the EU, the cabinet of Theresa May might be dismissed at any moment. Some experts suggest that in this case, the Conservatives will lose the leadership in the Parliament, and the next prime minister will give such stringent requirements for military spending up to for the sake of saving money. " Even 2% to military spending is already too much for UK amid Brexit." Obviously, if Downing Street takes this step, no exclusive relations with the US will be talked about. However, this can be to the better with the current head of the White House. Trump has a point. What good is NATO if most member countries don't even care to abide by what they agreed to?